Saturday, September 29, 2018, 6:00 - 10:00 p.m.
(Hungarian Sausage) Poboys and Hungarian pastries will be for sale. The Hungarian Settlement will celebrate 122 years of its existence with the Hungarian Harvest Dance Celebration on Saturday, September 29, 2018 at the American Legion Hall on Hwy. 43 near Springfield. Hungarian folk songs will be performed as well as the Hungarian Harvest Dance. 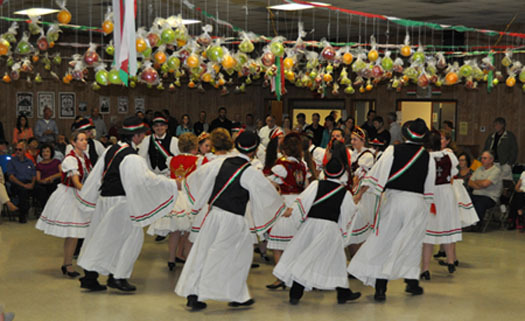 The dancers, dressed in traditional attire, that include white dresses and outfits trimmed in red, white, and green, will perform a series of dances that come from different parts of Hungary. This has been a tradition in Hungarian Settlement for over 120 years. The dancers will perform beneath a canopy of fruit and streamers of red, white, and green, the colors of the Hungarian flag. There will be a wine auction, which proceeds will benefit the continuance of the Hungarian culture of the community. Hungarian food, such as cabbage rolls, cabbage noodles, cucumber salad, and kolbász (a type of Hungarian sausage), will be available for sale at the Harvest Dance Celebration. Plus, Hungarian pastries, such as kiflik and kalács will be sold. Before and after the Harvest Dance performance, Ernest Breaux and his Poo-Yai Jamm Band will entertain the crowd. 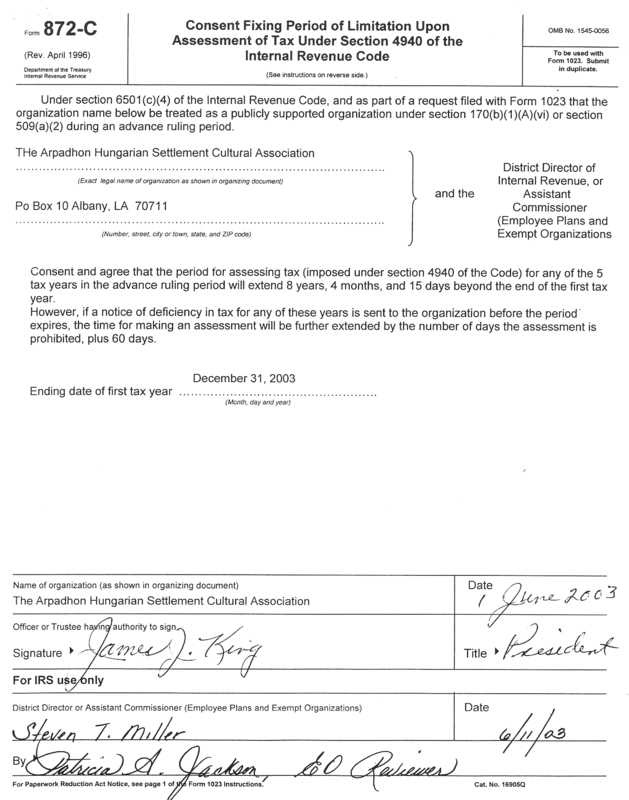 The (AHSCA) is based in a rural ethnic community known as Hungarian Settlement. The street address is 29025 Hwy. 43, Albany, Louisiana 70711. The mailing address is P.O. Box 10, Albany,Louisiana 70711. Louisiana Highway 43 runs north-south through the heart of Hungarian Settlement. Interstate 12 passes through the center of the community in an east-west direction. This ethnic enclave, once known as Árpádhon, contains many of the descendants of the early Magyar settlers who immigrated there near the turn of the twentieth century. At the present time, residents are striving to preserve at least some of the Hungarian culture of their ancestors, though much has changed over the past one-hundred-and-twenty years since the origin of this unique community. The purpose of the AHSCA website is to provide information, not only about this organization, but also about the community of which it is a part. The AHSCA is a registered non-profit organization. Visible clues are evident that Hungarian Settlement does indeed exist in the Albany-Springfield area of Livingston Parish, Louisiana. For example, a sign erected by the Louisiana Tourist Commission (pictured left) is located where La. Hwy. 43 intersects with Interstate 12 at exit 32. There are several other indications in this community that a Hungarian Settlement exists there. On La. Hwy. 43, the northern and southern entrances of this rural ethnic community are designated by two large green highway signs that proudly display the words,"HUNGARIAN SETTLEMENT."